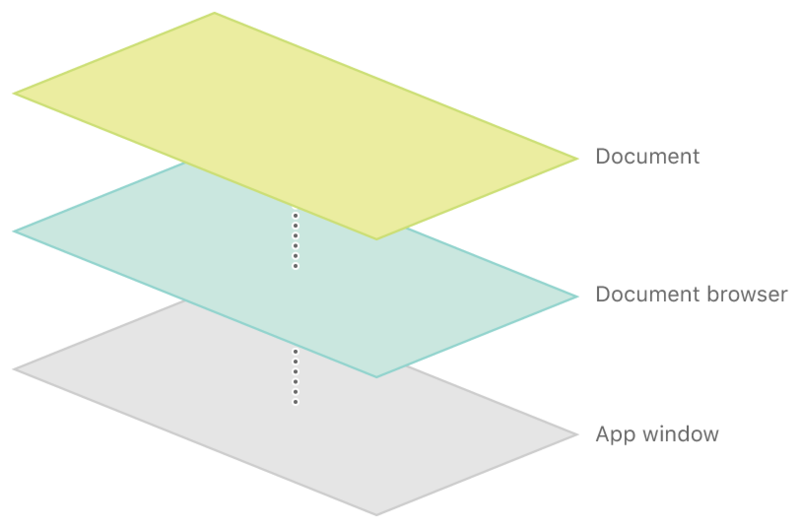 Use a document browser view controller as the root of your app's view hierarchy. When a user selects a document, you present its view controller modally from your document browser. Always assign the document browser as your app's root view controller. Don't place the document browser in a navigation controller, tab bar, or split view, and don't present the document browser modally. The browser automatically gives users the option to share documents using the Share button or a drag-and-drop action. It also provides a standard interface for browsing and managing documents. You set the type of documents that the user can select when the browser is first created. You can also set the browser's appearance, modify its behaviors, and add custom actions. Add a document browser view controller to your app. Display user-selected documents over your browser view controller. Give users the ability to import and export documents from your app. Customize the document browser’s look and behavior. Add custom document browser actions, activities, and bar items.